Pride usually goeth before the fall, in this case Pride happens with the fall! #Toronto @TORollerDerby shows the colours as the all queer roller derby event takes place at the Bunker on Friday, June 29, 2012. The bout is an official Pride Toronto event that will feature plenty of falls, slams, blocks and most definitely some bruising - falls come with a price dontchaknow. "Clam Slam is the annual Pride week face off between Vagine Regime Canada and the Clam Diggers; both teams comprised of skaters from various leagues across North America! 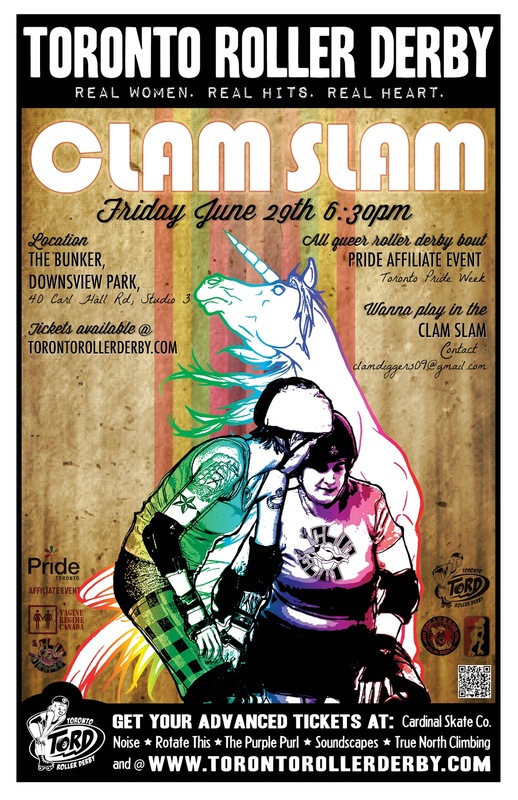 Clam Slam happens Friday June 29th, at The Bunker, Downsview Park. If you are interested in skating in Clam Slam, please contact the organizers at clamdiggers09@gmail.com. Tickets will be on sale online and in stores later this week."